If you have two ISPs or two different links for same destination, then you can configure floating static route. Floating static route allows you to failover the link if the primary link fails. This is accomplished by using preference and qualified-next hop feature available in JunOS operating system. 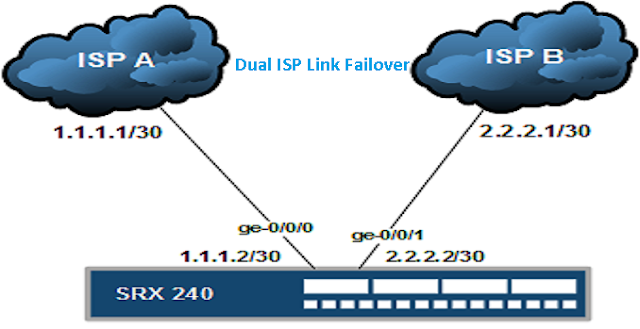 To configure dual ISP link failover in Juniper SRX you need two ISP links. This technique is not just for ISP links. You can apply this technique to any dual link scenario that have same destination network. SRX series, MX series and J series devices are mostly used in these types of scenario. We have two ISPs, ISP A and ISP B. What we want to accomplish is, if primary ISP’s link fail, then switch the link through secondary link to ISP B. So, let’s get started. We need to configure the routing table under [routing-options] hierarchy. In this way you can configure floating static route in JunOS systems.